By Anthony D. Smith, IMLS Senior Program Officer Libraries were called upon to provide a level of comfort and stability to many of the millions of citizens who had their lives dramatically disrupted by widespread electrical power outages, brought on by a recent sudden storm. More than three million customers lost power, many for as long as a week. The lack of air conditioning during a time of record-breaking temperatures created a volatile situation and serious health threat for many, especially the elderly. In Prince George’s County, Maryland, libraries opened their doors to community residents looking for an escape from the heat. In the Baltimore County community of Parkville, branch manager Elizabeth Nasby told the Parkville Patch that people were using the library to escape the heat and charge their devices. "Our parking lot is packed, there's been a line to use the public computers,” she said. “Nearly every place we have an outlet is in use." In Central Ohio, the Whitehall community managed to escape the widespread power outages experienced by many neighboring communities. Because of this, Whitehall Library opened its doors to citizens from surrounding areas, providing relief from the heat and access to public computers. The power is out, but the library is open! Photo of Arlington's Central Public Library. Photo by Alex Zealand. 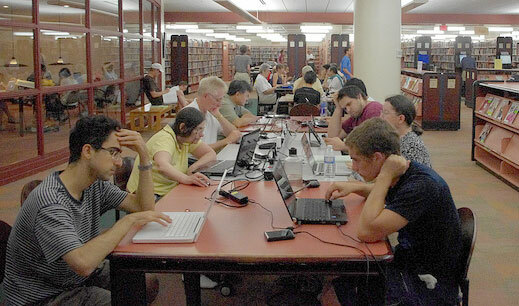 In Arlington, Virginia, residents passed time in the Central Public Library after it was made an official cooling station. On the Monday after the storm, the Arlington Public Library website reported, “By 2:30 p.m. Sunday, over 600 people were perched on practically every available service at the Central Library. They were reading and studying, charging cell phones and computers, using the WiFi, and checking in with distant loved ones..” The speed and severity of the storm caught many by total surprise. In the meantime, libraries all across the storm-ravaged region that managed to avoid power disruptions provided the services that are part of their normal day-to-day operation. On any given day throughout the year, libraries provide information resources needed to help improve the lives of the community members they serve. As often happens during a crisis, many more people than usual came to appreciate the value of these community anchors.